Jwalapuram – the City of Fire! Scientists and archaeologists believe this city located in the Kurnool district of Andhra Pradesh survived the catastrophic Toba eruption. Excavations prove this theory. The Toba supervolcanic eruption occurred at the site of present-day Lake Toba in Sumatra, Indonesia about 75,000 years ago. It is one of the Earth’s largest known eruptions. This cataclysmic volcanic event did affect existing civilizations during that period. Scientists researching on Toba supereruption believe the event caused a global volcanic winter of six to ten years. Lakhs of living beings including human beings perished. 3000 cubic kilometers of rock, mud and ash material were thrown into the air during the explosion or series of explosions, covering Aryavrat Bharata with 6-8 meters of ash and mud, destroying all vegetation, animals, plants, and known civilization. It also destroyed Europe, Africa, China and almost all the civilizations that existed during that time. Drifts in Pakistan and India reached as high as six meters. Smaller tephra beds blanketed the Middle East and East Africa. Great rafts of pumice filled the sea and drifted almost to Antarctica. This ash layer is measured over 1000 feet in thickness near the volcano to several inches as much as 2000 miles away. Signs of this volcano eruption are even recorded in the Greenland Ice cores. A thick layer of ash several inches to a foot think is found in cores pulled from the floor of the Indian and South China Sea. Civilizations existed in India 75,000 years ago. The archaeological site of Jwalapuram proves this. According to the Toba catastrophe theory, there were traces of hominid habitation before and after the Toba event in India. The Toba eruptions indeed blanketed the Indian subcontinent and many regions around the volcanic site in four to six inches of ash. But excavations in South India’s Jwalapuram Valley prove that people residing in that region endured the catastrophe. There were deposits above and below the ash layer where sets of stone tools were found by archaeologists. These stone artifacts were buried in layers of sediments just below the ash layer, proving the existence of ancient Vedic civilization. More than 15,000 stone artifacts were recovered from the three deepest units. A total of 23 categories of artifacts are represented, including forms that result from distinctive kinds of flaking. Rockshelter test excavations have indicated buried as assemblages, with one rockshelter containing dated microlithic assemblages at least 34,000 calibrated radiocarbon years old. Most of the artifacts discovered in Jwalapuram are agricultural implements. This proves that Bharata was inhabited by farming community even before 74,000 BCE and lies by the White Historians stand exposed. The theory that eight Neolithic founder crops from around 9,500 BC were cultivated in the Levant in the Eastern Mediterranean, that rice was domesticated in China between 11,500 and 6,200 BC, that Mesopotamia was one of the earliest cultivators of crops around 11,000 BC stand false. 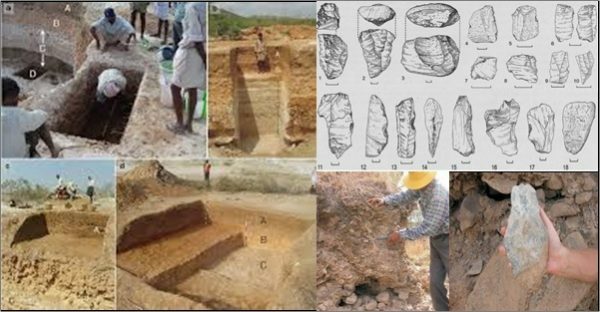 The 75000 year old agricultural implements of Jwalapuram substantiate the fact that cultivation was a part of the Indian culture thousands of years beyond the Mediterranean, China, and Mesopotamia agricultural antiquity! It is the need of the hour for the ASI to be strengthened to start work at a fast pace. Featured image courtesy: ResearchGate and Sanjeev Sabhlok.